Over the years we've celebrated Canadian Thanksgiving with a wide range of family and friends. At times we've squeezed upwards of thirty-five people in our small apartment. This year we had a slightly smaller guest list. There was very little to do to prepare tonight's dinner but I'd say it may have been slightly more challenging preparing dinner for three with two hungry babies around than it has previously been to prepare dinner for thirty-five with no one around at all. 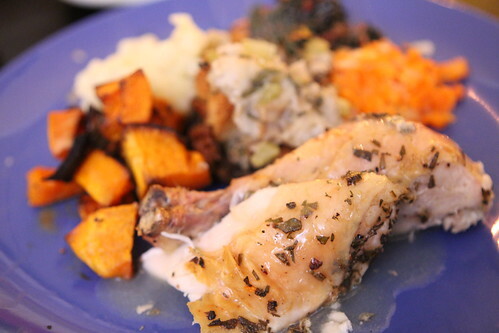 For dinner I didn't stray too far from Thanksgiving norms other than getting an extremely tiny turkey. I suspected it may actually have been a chicken. 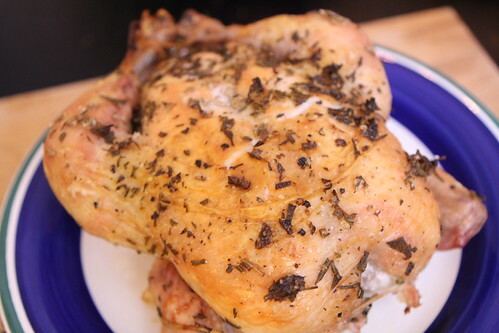 My butcher assured me that it was just a tiny baby turkey so I believe him. He's never steered me wrong before. Except for that time he took my checking account information because he said a Nigerian prince was going to give me a million dollars. But that was an honest mistake. How could he have known that was actually a clever and elaborate scam! Things were a bit challenging for Jen as well, mainly because Elliott gave her a headbutt yesterday that knocked out her crown. This presented her with a difficult time of eating dinner as well as saying the word "fifty." 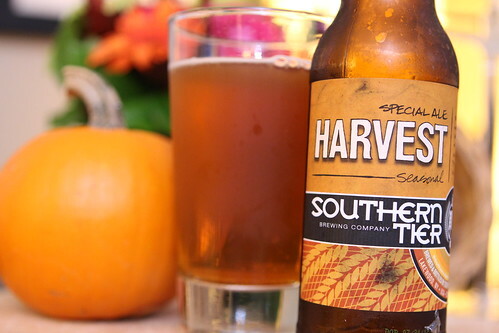 As I prepared dinner I enjoyed a seasonal Harvest Ale from Southern Tier Brewing Company. This was completely different than what I expected but extremely delicious. It had a very pronounced grapefruit juice flavor from the hops but not terribly hoppy. It was a very nice warm up for a celebration of the harvest. 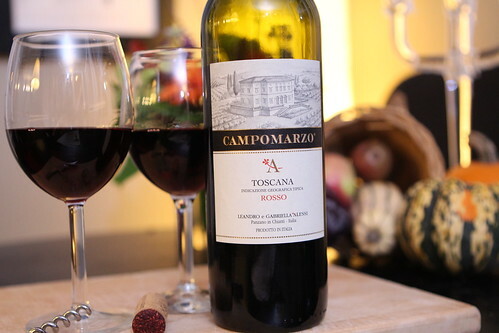 With dinner we opened this Campomarzo Toscana Rosso. Italian wines are clearly the most appropriate beverage to serve with Canadian Thanksgiving dinner. It's what the early settlers used to enjoy on those long, cold Canadian nights. For dessert Jen made this tart out of our millionaire apple-picking expedition. 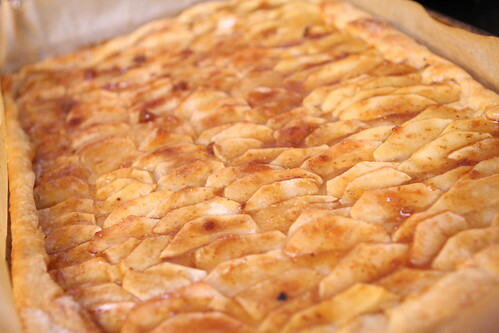 Jen made a great tart dough, topped it with apples, baked it, and glazed it with a mixture of sugar and fig jam. Jen made this because she figured her mum would be sick of pumpkin pie after their Canadian Thanksgiving celebration last night. Sadly Jen's mum was disappointed because after eating pumpkin pie last night, this morning for breakfast, and this afternoon for lunch, she had been hoping to have some more for dinner. So much for Jen's best intentions. I fly out for California in the morning so we weren't actually going to do anything for Canadian Thanksgiving but, after a bit of work, it was certainly worth it to not let our traditions languish. It may not have been the giant extravaganza we've had in past years but it was a good way to introduce the boys to this tradition. They are, after all, Canadians. What better way of celebrating the harvest than by having a dinner of breast milk and baby formula?